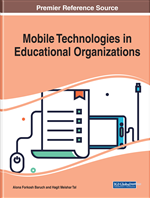 This chapter explores the use of smartphones, a category of mobile learning, as learning devices that align well with tenets of universal design for learning (UDL). The theoretical foundation for this use is explored along with pertinent research. The chapter continues with an exploration of specific apps that reflect the tenets of UDL even as they promote learning, specifically executive function, collaboration, and knowledge acquisition and expression. Guidelines for select and successfully using apps as learning tools are provided along with a discussion of barriers to use. Recommendations for use, including actionable ideas for integration, are provided. As technology continues its rapid evolution, keeping up with that change and integrating technology into teaching and learning remains essential. Tomorrow’s high school graduates must be prepared to compete in a digital, global economy that is becoming more mobile every day. Yesterday’s desktops and other stationary devices have given way to mobile devices such as laptops, smartphones, and tablets that continue to be integrated into classrooms be it through school-based one-to-one programs or with students using their own devices to use during class time. The devices themselves are only part of this evolution. When the tools are paired with rich but uncomplicated applications (apps) that support content acquisition, engagement, and collaboration, the way in which students learn changes. The tools not only become more accessible, but the learning shifts to mastery-based and individualized approach which is ideal for a larger spectrum of learners including students with disabilities within general education classes. Smartphones are ubiquitous and used by most teens and adults for communicating, socializing, gaming, conducting business, finding information and identifying solutions to problems, and navigating from point to point. Smartphone ownership and use has become commonplace among teenagers ages 13-17 years old. Eighty-eight percent of teenagers have or have access to a cell phones or smartphones (Lenhart, 2015); 91 percent of teenagers access the Internet on cell phones, tablets and other mobile devices at least occasionally (Lenhart, 2015). This group of young people has been dubbed, now for more than a decade, “Digital Natives” (Prensky, 2005), the “Net Generation” (Tapscott, 1999; Tapscott, 2009) as a result of the impact that digital devices and Internet capabilities have had on all areas of their lives. Access and ownership of smartphones increases the amount of time teens spend online, even in learning situations. We are now in an era that requires meaningful ways to effectively integrate apps and smartphones into the classroom, rather than ban them. Research continues to be conducted on teen’s use of smartphones and the Internet. In a recent report, Lenhart (2015) noted 92% of teens report going online daily with an overwhelming 24% of teens age 13-17 indicating they consistently access the internet while more than half (56%) of teens access the Internet several times a day, and only 12% report once-a-day use. Within learning contexts, accessing information for academic projects, analysis of information, and collaborative interactions through mobile devices supports engagement through readily available and accessible tools and resources. Some educators realize the vital need to integrate technology as a means for the delivery of information, such as with classroom blogs to post relevant information related to course content, participating in conversations outside of class related to the course, and facilitating synchronous group conversations through such platforms as Facetime, Skype, or Messenger.